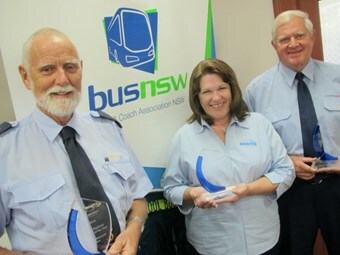 A highlight of this year’s BusNSW annual general meeting at North Parramatta on February 24 was the presentation of awards to NSW’s best bus and coach drivers. The awards were presented by sponsor Mobitech/Thoreb, represented by Bob Barwick, and Transport NSW Director-General Les Wielinga. Best driver awards were presented across three categories, Metropolitan and Outer-Metropolitan Bus Driver of the year, Regional and Rural Bus Driver of the year, and Coach Driver of the year. BusNSW Executive Director Darryl Mellish convened the award ceremony, saying the association was proud to acknowledge the performance and achievements of drivers within the industry. Mellish says each winner must have a high standard of personal presentation, always greet passengers in a polite and friendly manner, always drive safely, and be courteous to other drivers on the road. "It is important to recognise the best drivers in our industry – those who exhibit a positive and cooperative attitude towards their passengers," he says. Mellish says it was a lengthy search to find the best bus drivers for 2010, and he thanked all passengers and bus operators who participated in the nomination process. First recipient of a best driver award for 2010 was Dion’s Bus Service driver Donna Pudo, winning the Metropolitan and Outer-Metropolitan Bus Driver of the Year. Pudo’s winning nomination was based on her exceptional customer service skills, backed up by testimonials from customers who describe her as a friendly and helpful driver, going well beyond the call of duty to ensure the trip is enjoyable. The citation says Pudo is always on the lookout for her colleagues and alerts them to issues that might affect them. "She actively represents drivers on the company’s OH&S Committee and is a great contributor at operations meetings," Mellish says, on reading the citation. "Due to her positive attitude, dedication and overall commitment to her work Donna was recently awarded her company’s ‘Employee of the Year’ Award." Pudo thanked BusNSW for providing the award. "I am very proud to win it and I would like to say thank you to Les Dion my boss," Pudo says. "Les is not only a great boss but also a great friend who has always supported me at Dion’s." Stepping up to the plate to receive Regional and Rural Bus Driver of the Year was long-term Busways driver Brian Dunnacliff. Mellish says Dunnacliff has worked for various operators at Busways’ Wauchope depot for over 22 years. "The school routes that he drives are on one of the most dangerous roads in the area travelling back and forth on Comboyne Mountain, collecting students from Byabarra and Huntington Schools and also Wauchope schools," he says. "School Principals describe Brian as an extremely safe and conscientious bus driver who is friendly, easy to communicate with and very approachable nature, with a great enthusiasm and love for his job." Dunnacliff also thanked his employer for supporting his award nomination. "I would like to thank the Busways Group, and although I have been at the yard for about 23 years and we’ve had Busways for eight years they are a very solid company," Dunnacliff says. "As a driver it gives you a nice feeling of security working for such a solid company." A popular choice for Coach Driver of the Year was Hunter Valley Buses’ Geoff Pendlebury. Mellish says Pendlebury had demonstrated outstanding performance in his position as a coach and charter driver. "Included with Geoff’s nomination were many letters from travellers and school teachers expressing gratitude, praise and adulation for his professionalism, driving skills and the care he takes ensuring each passenger or student has a safe and happy holiday or excursion," Mellish says. "In his spare time he is a volunteer driver for several charities, some of which include the House with No Steps Annual trip to Sydney, The Breast Cancer Picnic Day, Rotary Charity Christmas Shopping Trips and the Annual Lake Bike Ride for the John Hunter Children’s Hospital." Mellish says Pendlebury’s compassionate nature, mixed with endearing sense of fun, knowledge and experience makes him an ideal coach captain. Pendlebury seemed overawed by the occasion, and encouraged all operators no matter how small to nominate their drivers for the BusNSW awards. "It’s a wonderful award," says Pendlebury. "When I received this letter it was very daunting, the reason being is that when you are on the road you meet many other great drivers." He says he felt appreciated just by being nominated. "There are so many people out there, and if you have a small bus company, nominate your drivers," Pendlebury says.